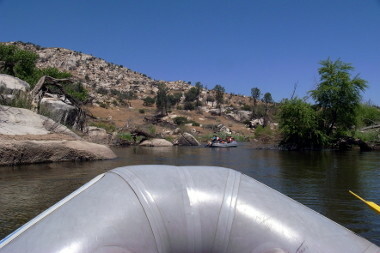 The following is a review of our Lower Kern rafting trip by two customers who joined us on our first 2-day trip of the 2009 season over Memorial Weekend. The original post can be found on their blog at www.justinsomnia.org. Thanks for the kind words and we’re so happy to hear that you had a great trip! 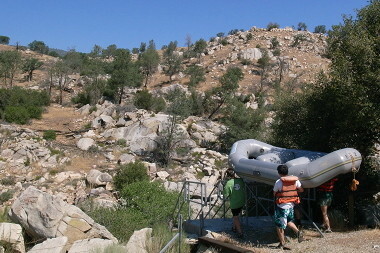 Last weekend Stephanie and I drove down to Bakersfield to go whitewater rafting on the Kern River. We’d discovered the Kern coming home from Death Valley last year and made a point of going back to go rafting—which neither of us had done before. The three day Memorial Day weekend provided the perfect opportunity. We signed up for a two day trip, camping overnight on the river. Bakersfield is very flat, not exactly what you’d consider a hotspot for whitewater. 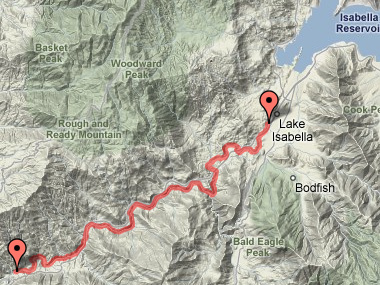 But just east is the southern tip of the Sierra Nevadas, through which the Kern River flows. After spending the night at a Motel 6, we drove along the river up to Lake Isabella, a dammed lake which forms the source of the Lower Kern. 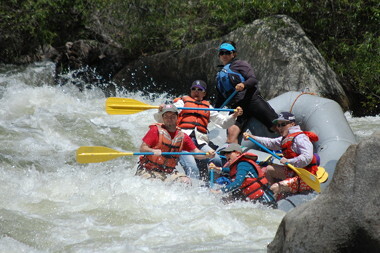 There we met our guides from Kern River Outfitters: Ryan and Abby. They introduced themselves, both had multiple years of experience rafting the Kern, and they went over the basic orientation: wear your life-vest tight and don’t bring anything valuable on the boats. I decided I was going to take my camera in the waterproof, see-through camera bag I’d bought for the trip anyhow. Hell, if I lost my camera, that’d just give me one more reason to part with $2430. Finally we were in the boats, Stephanie and I went with the two parents and Abby, and the four kids with Ryan. At the beginning the water was calm, so we practiced our strokes, which meant taking commands from Abby who told us what to paddle when. “Forward-one”, “forward-two”, and “forward-three” will be burnt into my memory forever. 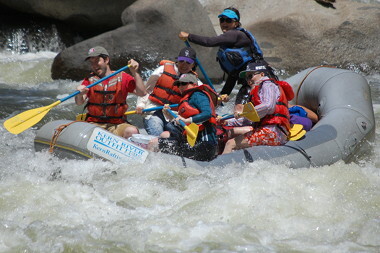 It’s hard to actually describe the rafting part other than to say I liked it when I got splashed! 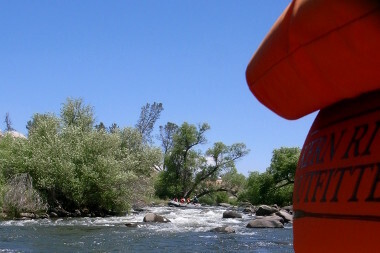 It was not a continuous series of rapids, but rather several distinct and short sections of Class II, III, and IV rapids punctuated by longer sections of smoother water. I also found out that it was well-nigh impossible to take any pictures while you’re actually going through the rapids, because you’re busy paddling like crazy. So most of my pictures on the boat are in calmer waters. I knew this trip was going to be really special when we stopped for lunch. 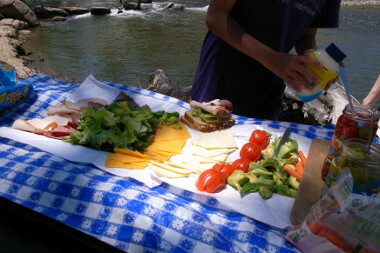 While we gulped down cold juice, Ryan and Abby prepared a gourmet deli lunch on one of our rafts, flipped upside-down. They put out several kinds of whole grain bread, sliced avocados and tomatoes, sliced cheddar and pepper-jack cheese, romaine lettuce, deli ham and turkey, with like eight different condiments, including pickles, roasted red peppers, two types of mustard, mayo, and horseradish. There was plenty for all of us to make heaping sandwiches and come back for more. 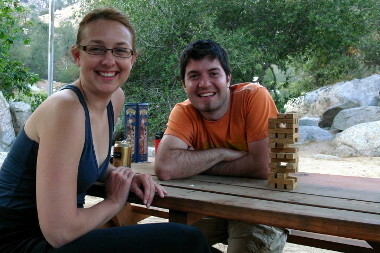 After an afternoon of paddling (now just a happy blur in my memory), we stopped for the night at their private campground. Ryan and Abby immediately set to preparing dinner in their fully outfitted cooking area. They put out some “hors d’oeuvres” (chips, salsa, bread, and homemade spinach dip), while we explored their game library. Dinner was ridiculous. I mean that in the best way. 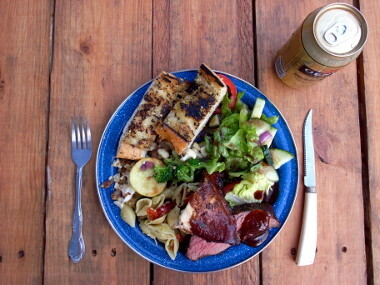 Somehow they managed to make a fresh salad, garlic bread, roasted vegetables, pasta salad with sun-dried tomatoes and pine nuts, smoked chicken, and tri-tip. I started joking that this was really an outdoor cooking trip with a little bit of whitewater rafting on the side. There were sleeping decks situated through the campground, along with inflatable sleeping pads. The weather was warm enough that we didn’t need our tent (which we had brought just in case). 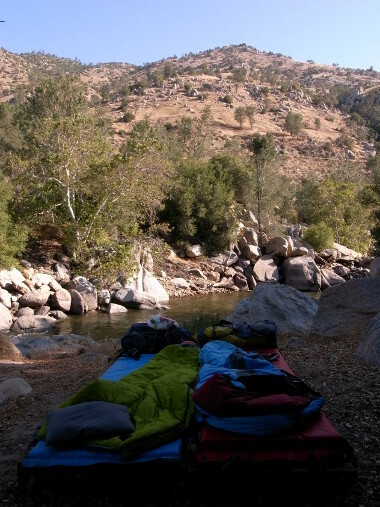 We slept in our sleeping bags, under the stars, with the sound of the Kern River below us. The next morning we had another gourmet camping meal, toasted bagels, cheesy eggs, bacon, fruit salad, coffee and tea. We packed everything up, and headed down to the river for our second day of whitewater, this one had a little more Class III and IV than the previous day. Once again it was a blast. 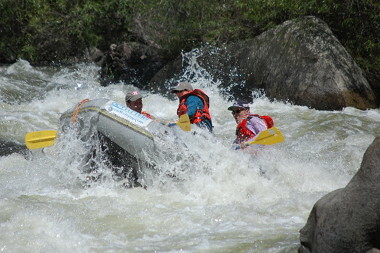 They’d even stationed a photographer at one section of rapids so we got some great shots of us going through the whitewater. Click here to view the original post on their blog!